Both of these players, aged 19 and 20, are nominally the “next generation,” but the latter has already arrived—he’s in the top 10 and has racked up more titles this year than anyone not named Roger Federer or Rafael Nadal. The other one won today in Cincinnati. Conditions were perfect for the upset: Frances Tiafoe was fresh. He hasn’t had a tour-level win since Wimbledon, where he beat Robin Haase in the first round before getting smashed in the second by—well, by Sascha Zverev. Sascha Zverev has done little else but win in that same span. After a fourth-round Wimbledon exit he won a 500-level event in Washington. He won the Masters 1000 in Montreal. He won ten matches in a row, beating everyone from Kei Nishikori to Nick Kyrgios to Kevin Anderson (twice) to Roger Federer. Through no fault of his own—mostly through the absence of any faults at all—he wound up playing way too much tennis on egg-fryingly hot hard courts in August. Dude was worn-out and finally beatable. To precisely locate Tiafoe’s ceiling is way beyond my pay grade. Many U.S. outlets, including this one, have been quick to hype the most promising American teen in the men’s game. 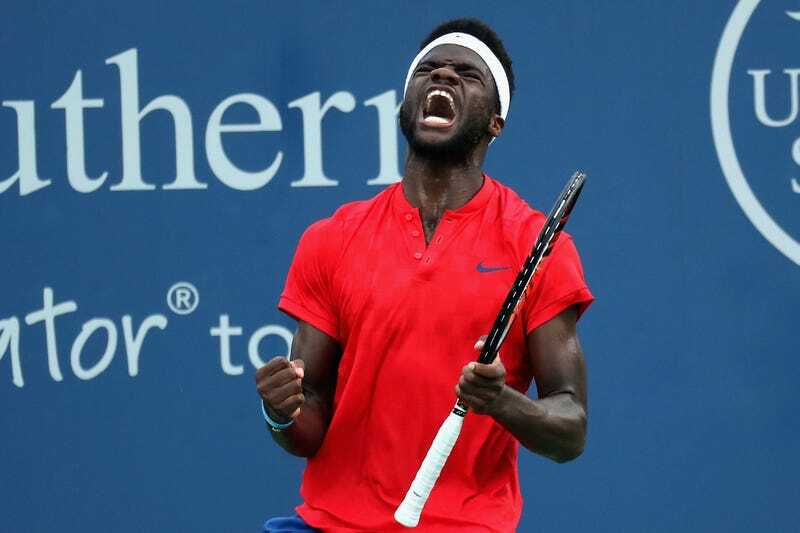 Not just because of the drought of local talent in the top ten, but also due to the electricity of his playstyle, evident sense of humor, and background: his dad was a custodian at a tennis center, and in his early years Tiafoe taught himself to play while wandering the facility alone. Unlike Zverev, whose mechanics bear the diagrammable perfection you might expect in a kid raised by two tennis instructors, Tiafoe’s strokes bear clear hallmarks of self-instruction, i.e. the dramatic loop that precedes his forehand, the sort of colorful “bad” habit a coach might have blotted out early on. Like Jack Sock, that slightly older American hope, Tiafoe’s Western forehand is a unruly whip, impossible to mimic without endangering your joints. But when he lines it up right he can wholly crush the ball, and he is fast as hell when getting around the court. “That’s probably the best I’ve ever felt on a tennis court,” he said after this win. Maybe his unorthodox style will never cleanly translate to Grand-Slam-type success, but the floor for him cannot possibly be very low, either. If you are the sort of American who wants to see countrymen at the top of the game, and have grown a little tired of waiting, you’re hoping he replicates today’s feat a whole lot in the decade to come.